An internationally-recognized and sought-after expert in pediatric orthopaedics, Dr. Afshin Aminian has presented at numerous conferences and meetings in the United States and abroad. He has presented several times at the International Meeting on Advanced Spine Techniques. He gave a presentation on the influence of surgical correction on thoracic hypokyphosis on sagittal spinal pelvic parameters in AIS, a second presentation on the correction of AIS via posterior medial derotational maneuver, and a third on thoracic kyphosis and sagittal pelvic parameters in AIS. An avid researcher of pediatric orthopaedic surgical procedures, Dr. Aminian seeks innovative ways to surgically correct spinal deformities. He is looking at prospective outcome studies on surgical patients with adolescent idiopathic scoliosis (AIS). Also, Dr. Aminian is assessing intraarticular enzymatic injections for Hurler’s Syndrome in a canine study. Leading the way in innovative solutions, Dr. Aminian’s clinical interests include scoliosis surgery, treating spinal deformities in children, and assessing surgical correction in relationship to patient outcome in radiographic parameters. 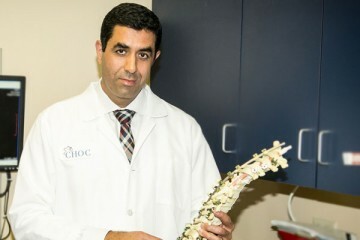 He is affiliated with the Pediatric Orthopedic Society of North America, the American Academy of Orthopedic Surgery and the Scoliosis Research Society. Dedicated to clinical excellence, Dr. Aminian is board certified in orthopaedic surgery. Prior to joining CHOC Children’s, Dr. Aminian earned his medical degree from Washington University School of Medicine. He completed his general surgery internship and residency in orthopaedic surgery at Northwestern Memorial Hospital in Chicago. 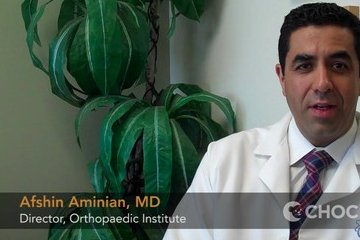 Dr. Aminian served his pediatric orthopedic fellowship at San Diego Children’s Hospital. Dr. Aminian speaks fluent Farsi. 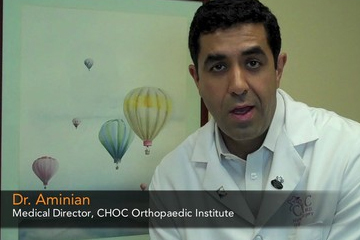 Meet Afshin Aminian, MD, as he talks about having scoliosis surgery at CHOC Children's. He'll introduce this series of videos we made just for teens. Orthopedic Medicine: What Every Pediatrician Should Know recorded on Saturday, May 21, 2016. Dr. Afshin Aminian shares how he entered pediatric medicine, going from electrical engineering to orthopaedic surgery. 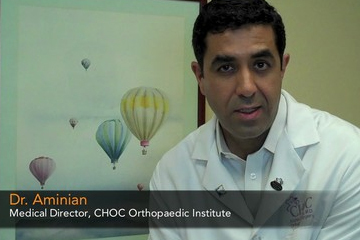 After scoliosis surgery activity & diet is very important explains Dr. Afshin Aminian. Feeling tired all the time is totally normal after scoliosis surgery. 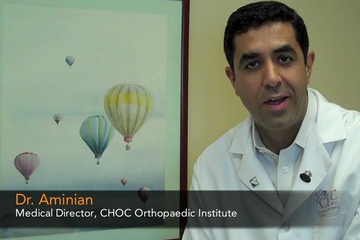 Dr. Afshin Aminian talks about pain management after having scoliosis surgery. Learn more about what to expect & how to deal with pain once you come home. Scoliosis is a medical condition in which the spine is curved in either an "s" or "c" shape. If caught early, it can be treated with a bracing program. 1201 W La Veta Ave, Orange, CA.